The group behind Michigan’s adult use marijuana ballot initiative funded a study investigating the measure’s potential fiscal impacts. The legalization of adult use marijuana in Michigan would generate $130 million a year in new tax revenue for the state, according to an economic study from national marijuana consulting firm VS Strategies of Colorado. In less than a month, Michigan voters will head to the polls to decide on Proposal 1, a measure that legalizes the sale and possession of recreational marijuana. The initiative allows adults 21 and older to possess and buy up to 2 ½ ounces of marijuana, keep up to 10 ounces at home, and grow up to 12 plants for personal use. It also establishes a regulated market, and calls for a 10 percent excise tax and a 6 percent sales tax. If voters approve Proposal 1, and anticipating that retail sales would begin in 2020, the new analysis estimates that Michigan’s recreational marijuana market would grow to $800 million by 2024. 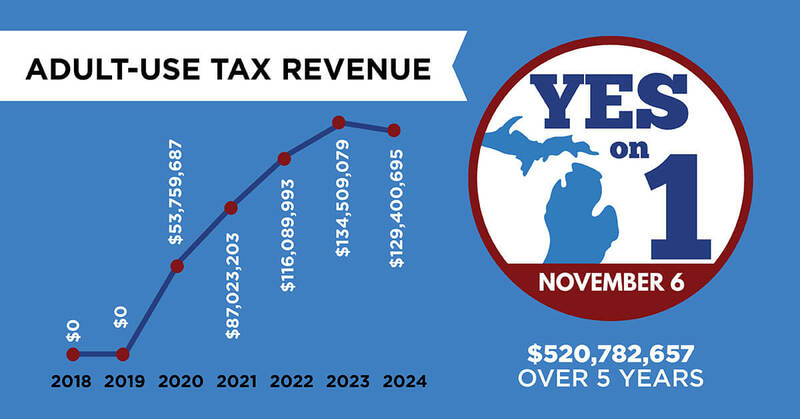 Michigan would generate a combined $520 million in revenue from excise and sales taxes over the legal market’s first five years. The state’s legal marijuana market is projected to reach maturity by 2023, then taper off slightly the following year as it matures and “competition slowly brings down prices,” VS Strategies economist Andrew Livingston told The Detroit News. Proposal 1 directs much of the revenue generated from marijuana taxes to Michigan’s roads, schools, and local communities that participate in the new industry. According to the analysis, that means the marijuana excise tax would provide the state with around $28 million a year in extra money for road repairs, $28 million for schools, and a combined $24 million for local governments. Together, Michigan’s medical and adult use marijuana sales are projected to generate a total of more than $160 million per year in revenue by 2022. Funded by the Coalition to Regulate Marijuana Like Alcohol, the study by VS Strategies used data from other legalization states while assessing the number and growth rate of Michigan marijuana consumers and patients and the number of likely tourists that will come in from outside the state to consume marijuana. Recent polling suggests that Michigan voters are poised to approve Proposal 1, which needs only a simple majority. In a new survey from WDIV/Detroit News, 62 percent of voters who were read the exact ballot language of Proposal 1 said they supported the measure, compared to 35 percent who were opposed. A majority of voters across nearly all demographics said they supported the proposal, including all age groups and “Leaning Republicans,” “Independent voters,” and “Democratic voters.” The only demographic opposed to the proposal was “Strong Republican” voters at a margin of 36.1 percent-60.7 percent. Earlier polls also suggest that the measure has a strong chance of passing. In January, TV station WDIV Local 4 and The Detroit News found that 57 percent of voters at the time supported legalization. Proposal 1 also recently received the endorsement of The Detroit Free Press, one of Michigan’s largest media outlets. Michigan is one of four states voting of marijuana measures in November. Learn more about where marijuana is on the ballot through our Election 2018 page. Keep up with changing cannabis laws through our news page, or learn more about current laws in the U.S. by visiting our education page.